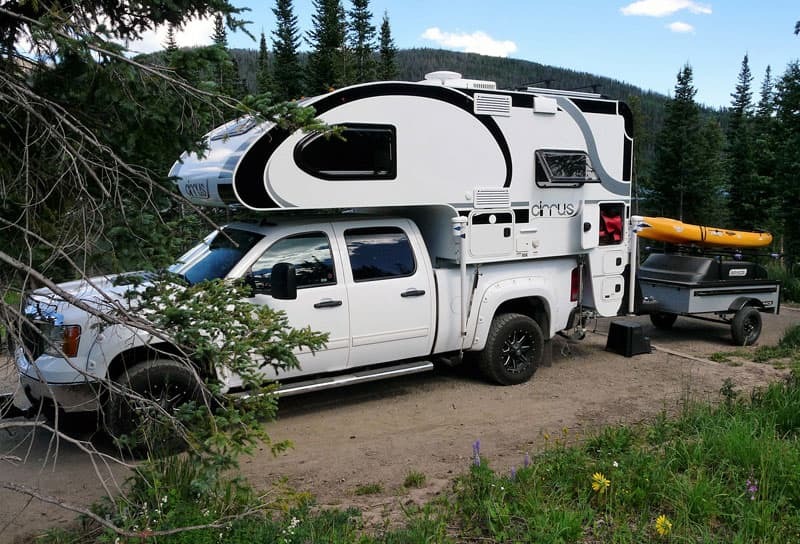 Like the 800, the 820 is a great truck camper for a short bed, single rear wheel truck. You need at least 3,500 pounds of payload capacity, but that’s very doable in a late model three-quarter ton or one-ton short bed. TCM: Tell us about truck camping with the Alde hydronic heating system. What’s it like to use the Alde system day to day? Gerald: The Alde heat system is like magic. It’s totally silent and efficient. I have run the system 24 hours a day and it uses very little propane. The radiant heat is the same in every part of the camper including the floor, walls, and bed. With the Froli bed system, the heat is underneath the bed, and there is no condensation. The system incorporates the water heater with almost instant hot water and instant recovery. That’s been fantastic. The Alde takes a bit longer to heat the camper when first turned on but, again, it’s more efficient, totally silent, and heats evenly throughout the camper. If it’s cold out, we leave it on all the time. The Alde system is probably the most innovative part of the camper. TCM: How is it different than the forced air systems you’ve had in your previous RVs? Gerald: The gas furnaces in RVs have uneven heat throughout the camper. In a couple of my truck campers there were sections in the camper where the temperature was different. For example, the dinette would be hot and the bedroom would be cold. With the forced air furnaces, I would set the camper at 55 at night and I would go through a 20-pound propane tank in three days. When we were in Pagosa Springs, Colorado with our Cirrus last spring, I had the refrigerator on, used the stove, and ran the Alde heat 24-hours a day for five days. I was still on the first tank and it was still in the green. It was like the Alde system wasn’t even using the propane. The Alde system also uses less amperage than a forced air heating system. As you know, the fan in a forced air heating system consumes a lot of amp hours. With the Alde system, my batteries never dip below 12.7 or 12.8 at night. Within 45 minutes in the morning, my solar panels have the batteries back at full charge. Since owning the Cirrus, we have had zero concerns about the heater and the power it’s using. I am more concerned about the television’s amp draw. My only concern about a closed, hydronic system is with the heat convectors and plumbing located behind the kitchen walls and nose of the unit. I wonder what would happen if something that needs to be fixed. The Europeans have been using Alde systems in their RVs for a long time, so I’m really not that concerned about it. The Alde system has worked perfect. I think Airstream has gone to the Alde system in their flagship camper. TCM: Tell us about your utility trailer and what you tow with it. Gerald: Ever since we’ve had truck campers, I’ve had a utility trailer. Once I spent an entire winter building a waterproof trailer for fly fishing and storage. I started researching utility trailers when I needed one for the Cirrus. During my research I came across Space Trailers. They’ve been out a few years. The brother of the owner moved to Denver and opened up a shop. I went and talked to him and examined how they are made. My 7-foot long neck Space Trailer can hold up to 1,000 pounds of gear. I got the long neck extension so I can turn 90-degrees and not bump into the camper. The footprint is 7-feet by 4-feet, and the raised fiberglass top can hold over 300 pounds. You can open the lid with all the toys on top. It has struts so it opens with one hand. It’s also 100% waterproof.